Inspired by the rich burgundys, navies, reds, and blues of the turn of the century, this collection of vintage miniprints is a traditional delight! The details in these little miniprints are extraordinary: reminiscent of the old mill-engraved prints from the 1800's. 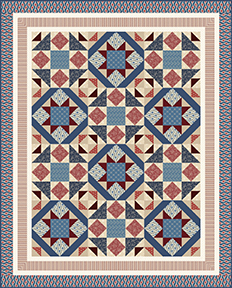 And the red/ivory/blue color theme makes the collection perfect not only for traditional style quilts, but for patriotic quilts and banners as well. Includes a great wallpaper stripe. A must-have for every quilt shop interested in history and fine design.